Are you suffering from headaches, migraines, insomnia, visual issues or eye ache? Maybe you have dental issues, sinus problems, TMJ issues, loss of smell, ear disturbances, including balance, neck pain, etc. All of these issues may be due to misalignment of your skull bones. Wellness Life Zone, Foot Zone Academy, foot zone education in Utah, discovered several foot zone acupressure/reflexology signals for the cranial bones. This discovery is huge for cranial related issues. A slight misalignment of the cranial bones may occur due to a difficult birth, poor posture, a fall, minor and major head injuries from sports, etc. Foot zoning, these newly discovered acupressure/reflexology points, will trigger the body’s innate blueprint to realign the cranial bones and resolve many health-related issues. Your head consists of 14 facial bones and 8 skull bones. 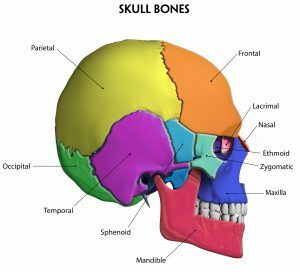 If you have ever had craniosacral therapy, you are very well aware that cranial bones are not fused together. Cranial bones are attached by suture joints and connective tissue and are filled with nerves and tiny blood vessels. The medical definition of joints is: the area where two bones are attached for the purpose of permitting body parts to move. A joint is usually formed of fibrous connective tissue. Although sutures joints are mainly fibrous joints, they do allow subtle movement for the cranial bones. Suture joints bring cranial bones together much like a jig-saw puzzle, and a slight misalignment of one cranial bone can be felt in an entirely different region of the cranium similar to the effects of plate tectonics. Highlighted below are major cranial bones associated with sinuses that may be affecting your health. Stimulating a healing effect for these sinus-related cranial bones can be helped by those trained in the best foot zone therapy through Wellness Life Zone, Foot Zone Academy, where these acupressure/reflexology signals were discovered. To find a professionally trained Foot Zone Practitioner near you who understands these signals, go to our directory at wellnesslifezone.com where you will find qualified foot zone practitioners and foot zone instructors. For more information about foot zoning, you may also access our free videos in the toolbar of our home page. Wellness Life Zone , Foot Zone Academy located in Salt Lake City, Utah is one of the fastest-growing foot zone certification schools in the United States. We offer the most advanced instruction and state-of-the-art resources of any foot zone education program nationwide. Member of Utah Foot Zone Association.